What Happened to Teaming for Technology? Teaming for Technology began as IBM's response to President Clinton’s call for a National Service Summit for America’s Future in January 1997. At the Summit later in April in Philadelphia, IBM announced its partnership with United Way and the Corporation for National and Community Service (CNCS) to address the concern that many vital community-based nonprofit organizations were being left behind in the digital revolution. Once they identified the problem, they worked together, "teamed for technology," to create a solution. IBM provided the technology, United Way provided management and oversight, and CNCS provided volunteers. The announced goal of the Teaming for Technology (T4T) program was to strengthen the technological capacity of nonprofits to: (1) increase their operational efficiency, (2) deliver their services more effectively, and (3) enhance their ability to leverage funds and other resources. To participate, agencies applied to their local T4T, and if they met certain criteria (IBM and United Way grant guidelines) a team of volunteers and technology professionals worked with them for one year, a "year of assistance." The T4T team worked with the agency to evaluate their needs and goals for agency improvement. Once the evaluation was complete, T4T created an individual technology plan for the next three-to-five years. The team then recruited community volunteers to help the agency fulfill the goals outlined in the plan. Agencies with the T4T technology plan often had more credibility with other grant programs because they had real, long-term goals to seek funding for and a sustainable structure in which to pursue them. A shelter program in Burlington, VT saved $5,000 per year in staff cost due to technology-based productivity gains. An agency serving Central Americans living in LA is saving $25,000 per year in printing costs by using e-mail to distribute its newsletter. An organization serving Hispanic neighborhoods in Fort Worth, TX built on its initial work with T4T and leveraged an additional $700,000 for technology programming. The eight pilot programs launched in 1997 increased 17 sites nationwide as the programs gained in popularity. These programs were not one-size-fits all: Each T4T reflected the "flavor” and needs of people in its area. Within the national framework, local T4T sites identified their own desired outcomes, activities, and partnerships to serve their communities. Some focused on technology planning, others emphasized computer recycling, and others specialized in software and hardware training. It was no surprise that these disparate approaches to technology programming could not be contained in a single program. 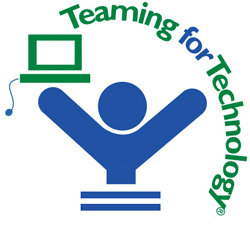 In 2003 the national version of the Teaming for Technology program officially ended. Many T4T sites closed before then, or changed in ways that required them to leave the program. Some couldn’t provide strong enough outcome measurement results to justify continued funding, while others branched off and became 501c3’s in their own right. Some United Ways dropped the program because it didn’t meet their agency’s goals, while others branched out and grew into something greater than the original Teaming for Technology program. Seven of the original initiatives are still operating, either with the original United Way partner or with new funding and sponsorship/sites. Several programs still operate T4T programs in their communities, most notably in Chicago, Philadelphia, Colorado, and Minnesota. T4T Chicago is the only T4T that does not charge for its services and maintains a 250% return to the community for every dollar invested into the program. Their web site is frequently updated with technology-related articles and news for non-profit organizations, a useful resource even for those outside of their service area. Philadelphia’s T4T offers training, technology assistance, and digital inclusion programs for a nominal membership fee. T4T Coloradooffers technology planning assistance, computer training, and free and reduced cost referrals through theTechLaunch grant provided by IBM. Minnesota’s T4T has maintained its relationship with IBM (who provides technology and volunteers) and is connected fully with its United Way. North Carolina’s T4T is working under the Triangle United Way, operates a computer recycling and volunteer program, and has become the largest MAR (Microsoft Authorized Refurbisher) in the Southeast. Other currently-operating sites that were built upon T4T programs include The Georgia Center for Nonprofits in Atlanta and TechNews at New York City's United Way. In addition to the different agencies and programs that Teaming for Technology influenced in its six year run, it left a valuable legacy: Information. IBM’s employee/retiree volunteer program, On Demand Community (ODC), is a global program that makes technology-related solutions available for IBM employees and retirees to use to help community nonprofits and schools. One of the most popular is the Technology Planning solution, which includes eight tools that were developed through IBM’s work in T4T. This information can be accessed by IBM employees and used to assist nonprofits all over the world. Whether T4T continues in its disparate forms or all of its incarnations dissolve in the years to come, it did, and is still doing, a lot of good. Teaming for Technology’s work proved that non-profit organizations can successfully adapt and flourish in the digital world. That’s a heartening thought for everyone in the nonprofit tech community. All past and present IBM employees can access Technology Planning solutions and others through their intranet, so nonprofits should give special consideration to recruiting IBM people as volunteers. ODC can provide up to $3,500 in technology or $1,000 in direct money annually to a nonprofit or school if the IBM volunteer donates 40 hours within five months. Special thanks to Heidi Kraemer of IBM and Jenika Faes of the Chicago Teaming for Technology for contributing to this report. Diana Hauer is a former VISTA with the RECA Foundation in Kennewick, WA, and now lives, works, reads, writes, and exercises in Portland, OR.